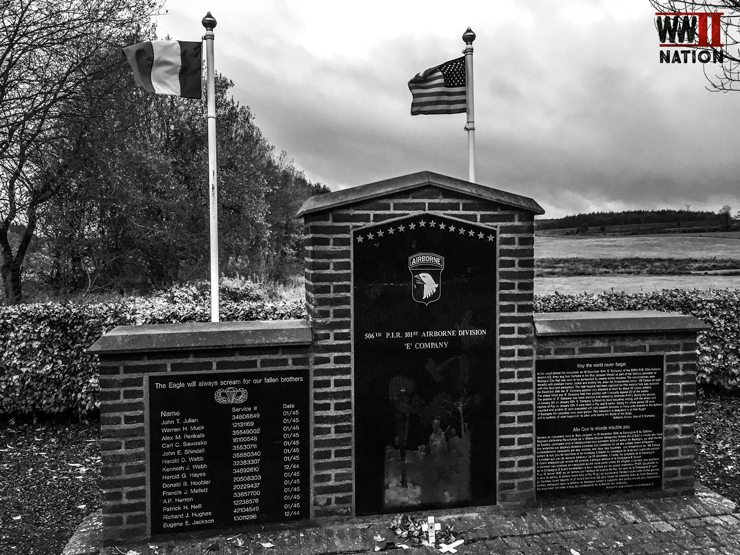 Following our trip to La Roche (which if you missed Day One, you can Read It Here), Day Two saw us spend the day learning more about the 101st Airborne Division and also Easy Company’s role in the defence of the town 72 years ago. 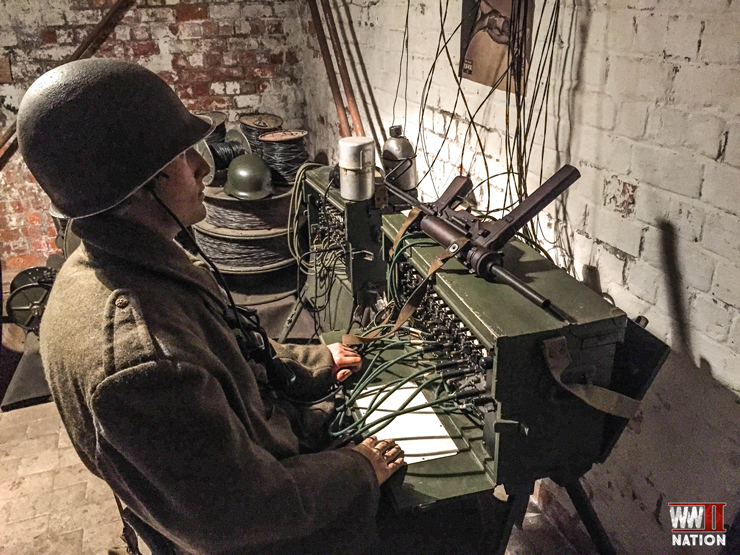 This included visiting the Heintz Barracks (or Bastogne Barracks) which was the nerve centre of the town’s defence during the siege, being the 101st Airborne Division’s Headquarters. 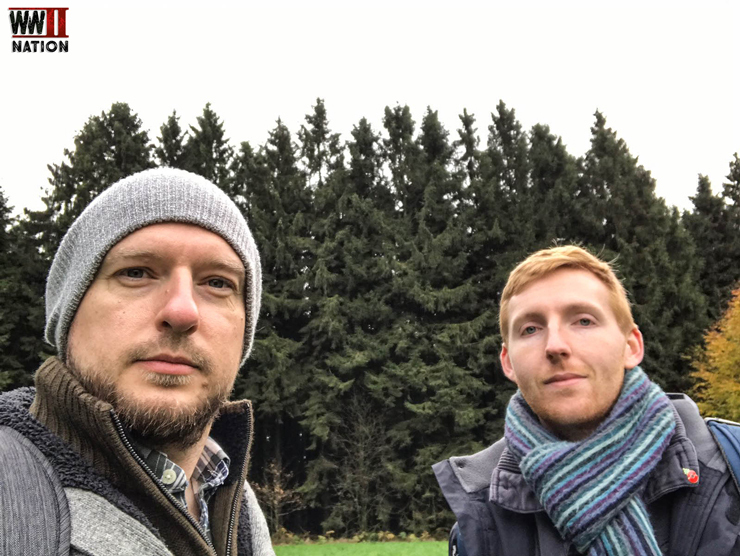 We also explore the Bois Jacques woods where Easy Company were positioned to help hold the town’s perimeter during the almost month long struggle as well as visit Foy which these men helped liberate in January 1945. 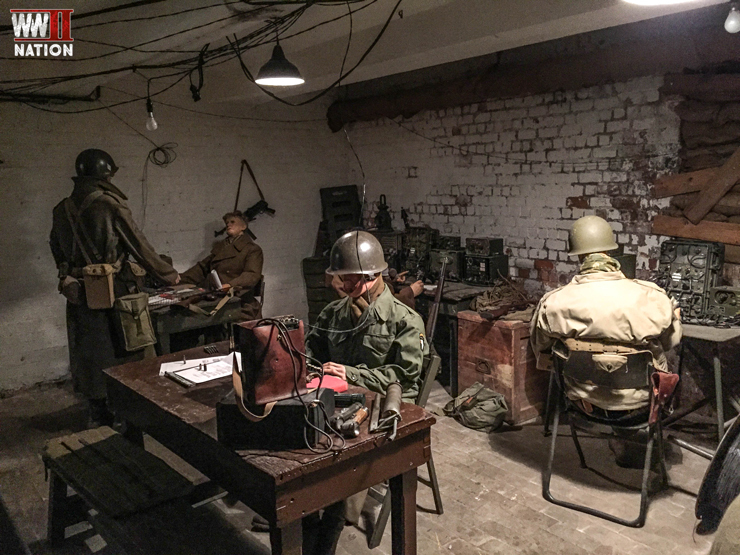 We started our day exploring the Heintz Barracks in the centre of Bastogne which was at the heart of the town’s defence during December – January 1945. 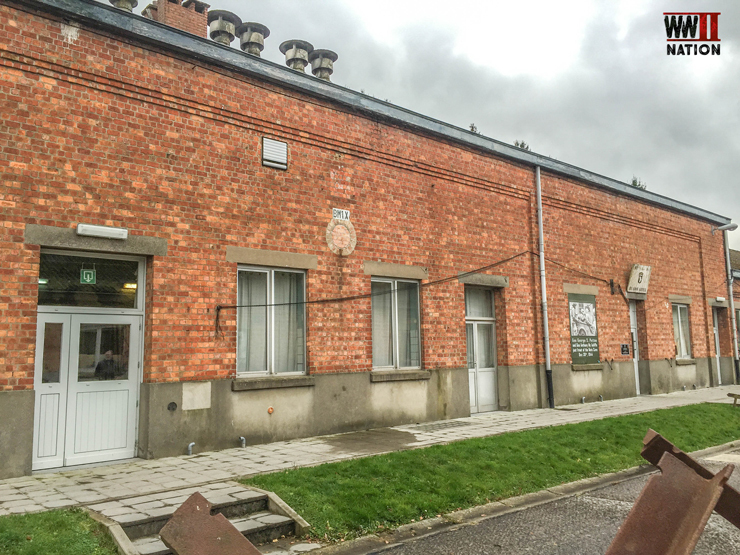 The Heintz Barracks, 72 years ago during one of the Allied airforce resupply drops to the besieged defenders of Bastogne. 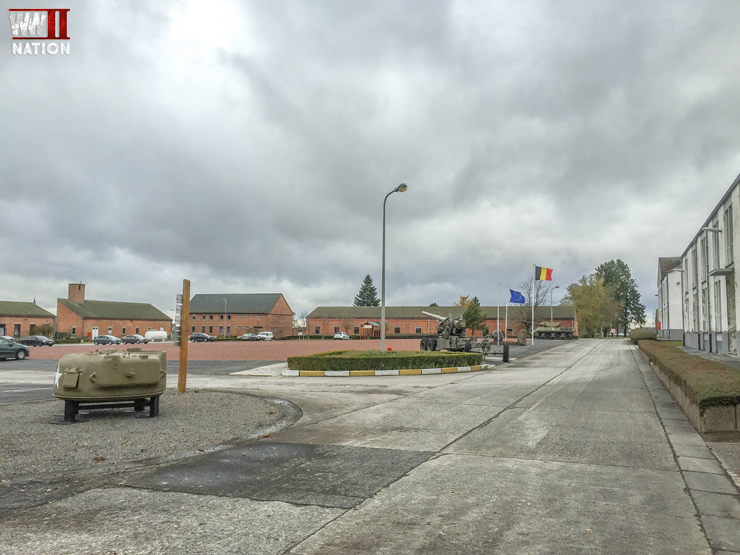 Built in 1934 and apparently named after the first Belgian Officer killed in the First World War, Heintz Barracks is still an operational Belgium army base. The first stop on our tour was the remarkable restoration centre. 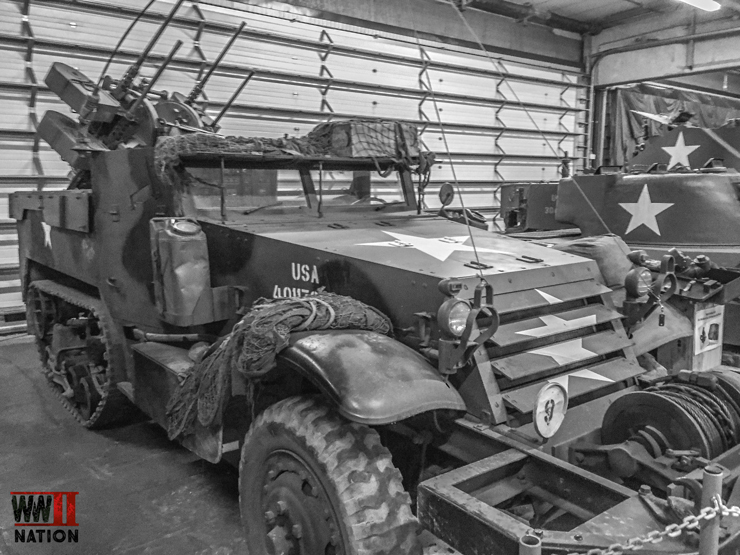 Numerous WW2 vehicles are sent here from miles around to be repaired and restored. Including these examples patiently sitting and waiting. 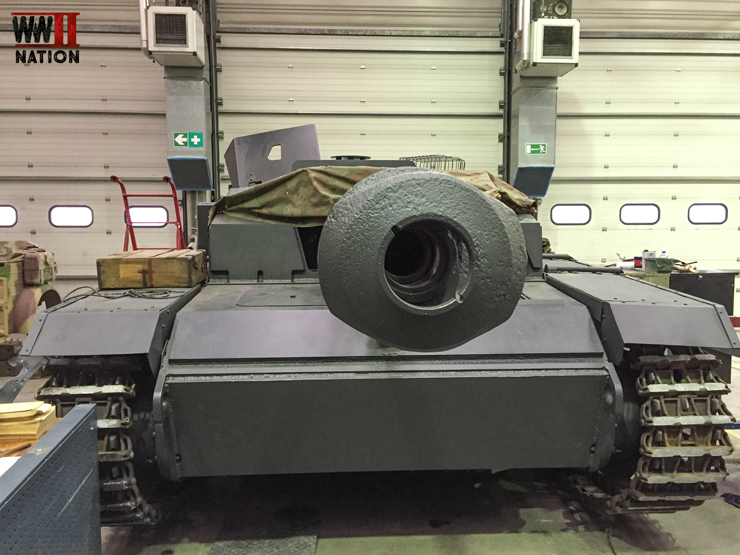 Once inside the restoration centre, we were shown this remarkable StuG III Ausf. 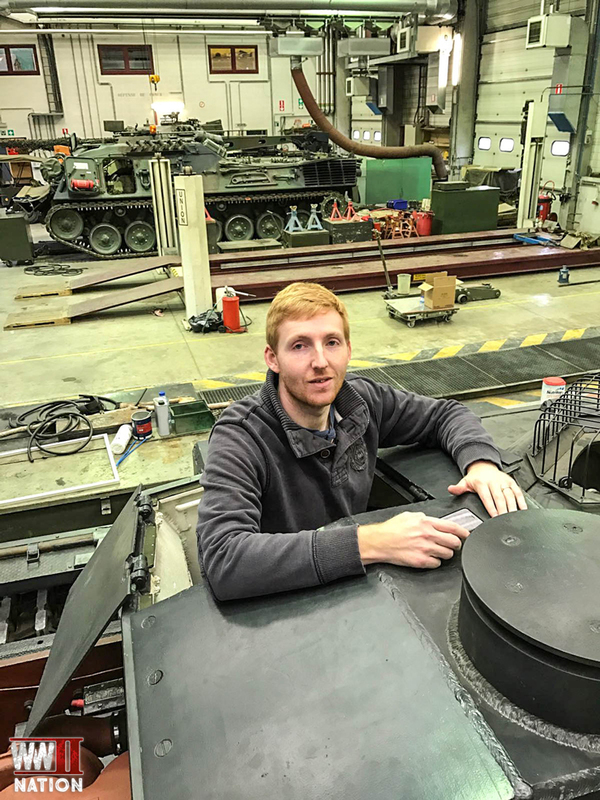 F/8 Assault Gun which is undergoing restoration and has been for the past 2 years. Produced between September to December 1942, only around 234 examples of this version were ever built. 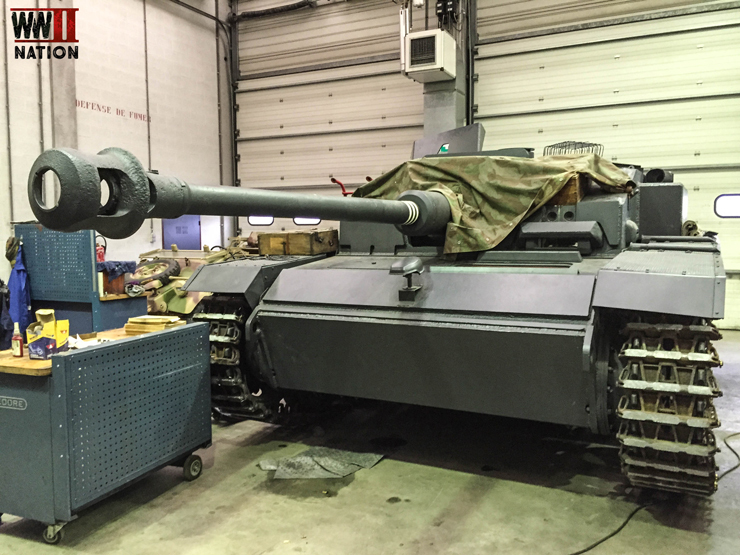 Exposed for maintenance work were the StuG’s Maybach HL 120 TRM engines which provided 300 HP. 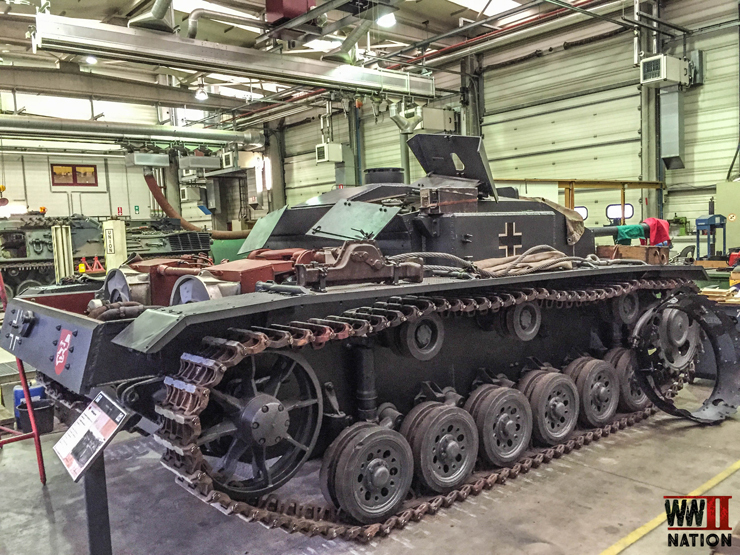 Weighing around 23 tonnes, the StuG was capable of speeds of 40 km/h on road, and 24 km/h off road. This version of the StuG was armed with a 75mm StuK 40 L/8 Gun and typically carried around 50 rounds on board. It was also equipped with an MG34. This StuG in fact served in Sicily with the Hermann Goering Division, was captured by the Americans and sent to the USA to be studied. 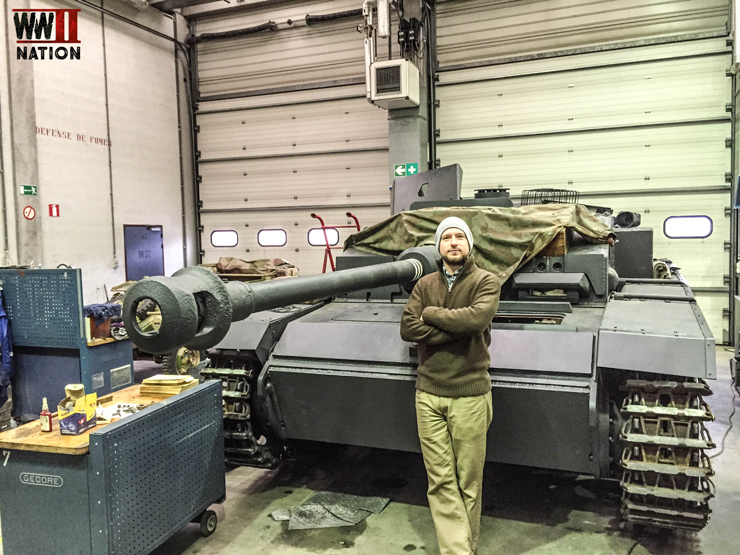 Through a combination of luck and I guess cheekiness we managed to get a quick peak inside the StuG. And one thing I can tell you, is that there is very little room to move around inside these tanks. 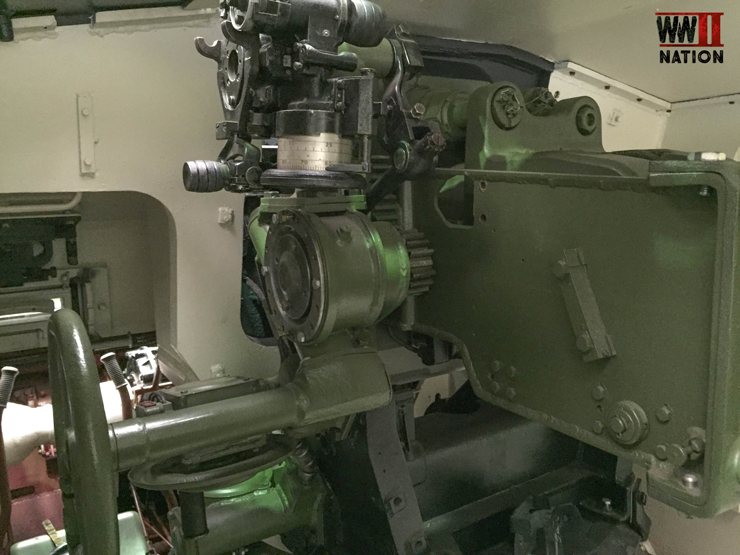 The Gunner’s Position inside the StuG. Typically there would be 4 men operating in these tight confines. 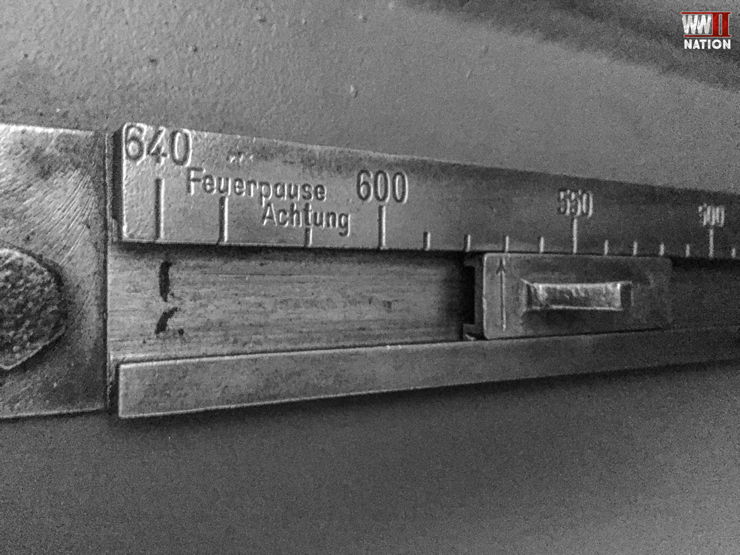 The Range Finder / Adjuster on the side of the 75mm assault gun. 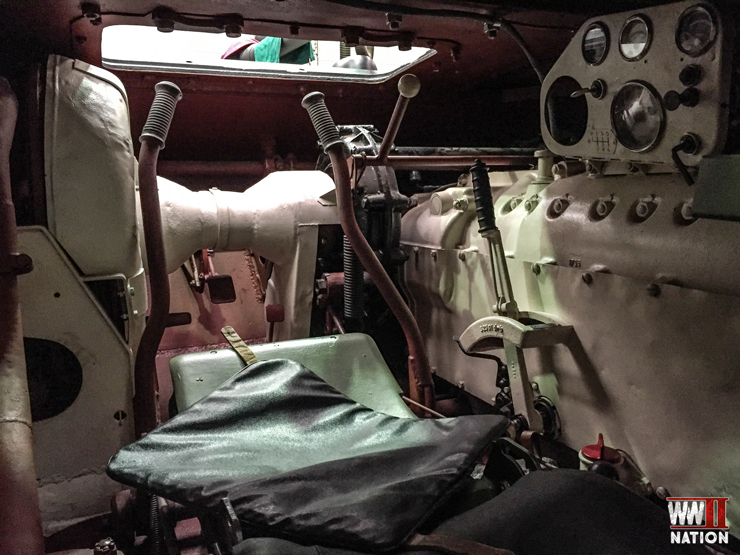 The driver’s compartment inside the StuG is probably the most claustrophobic part of the tank. I could not imagine having to try and get out of here quickly, certainly not at my height of 6 foot. 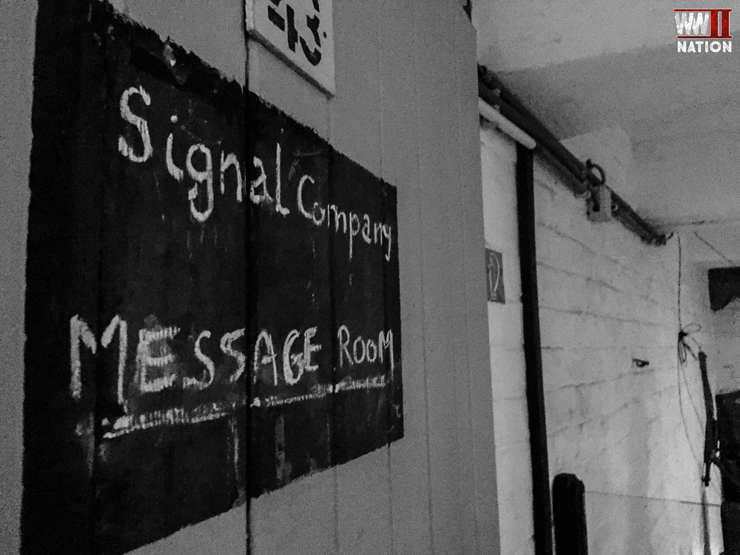 One thing that struck me other than the lack of space, was the lack of visibility and consequently awareness of what must have been going on outside around you. And the only way to fully see would be risking sticking your head outside the tank and exposing yourself to fire. 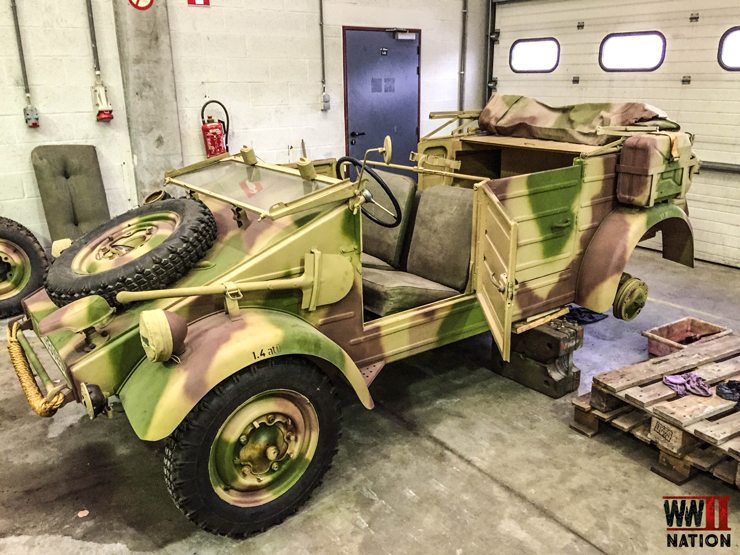 A Volkswagen Kubelwagen with its very colourful camouflage scheme currently under restoration at the Bastogne Barracks. Around 50,000 of these were produced for the German Army during WW2. A British QF 6 Pounder Mk II Anti-Tank Gun. Typically crewed by 3-4 men, the Mk II was manufactured during 1941 to 1943. Towing the 6 Pounder is a Ford powered Loyd Carrier Mk I. Around 26,000 of these armoured track towing carriers were produced during 1939 to 1945. A Staghound Armoured Reconnaissance Car T17E1. 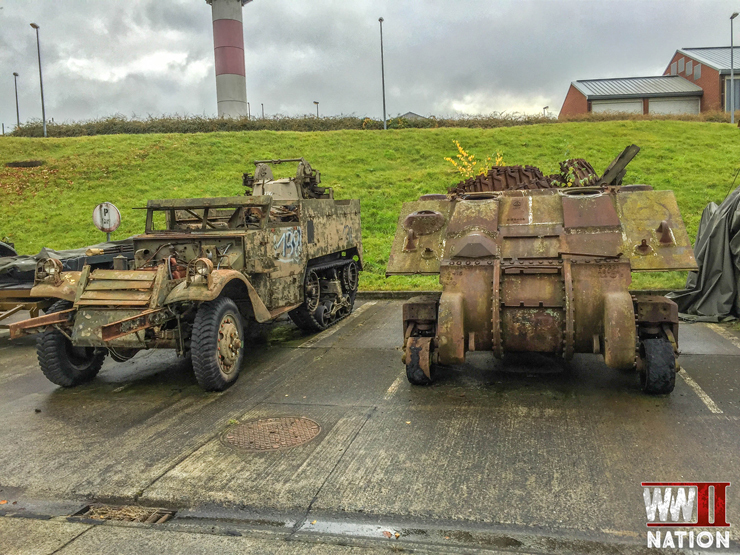 Built by America, these were actually predominately adopted and used by the British Army during WW2. With a crew of 5 and a 37mm main gun, just under 3000 of these were produced. We were fortunate to see a Staghound actually in action at the Chalke Valley History Festival back in July this year. 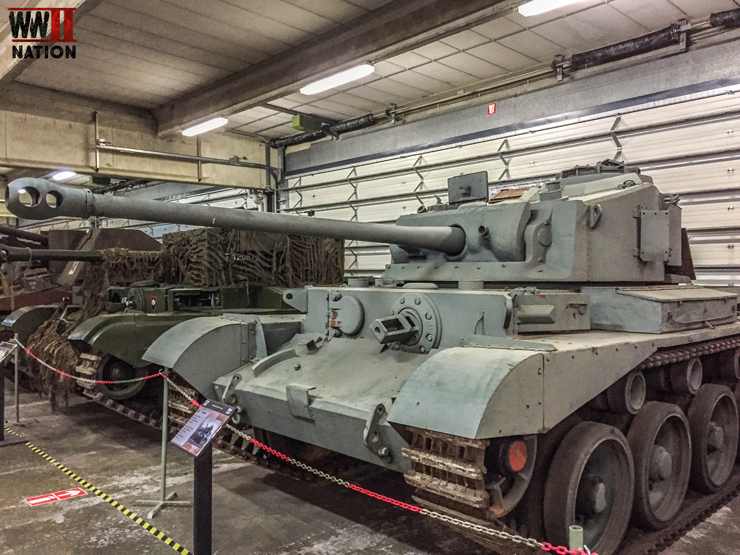 A British A34 Comet Medium Cruiser Tank. With its Rolls-Royce V12 Meteor engines this tank had a top speed of 51 km/h on road and was equipped with a 17 pounder main gun. The Panzerkampfwagen IV medium tank formed the backbone of German armoured units during World World Two. 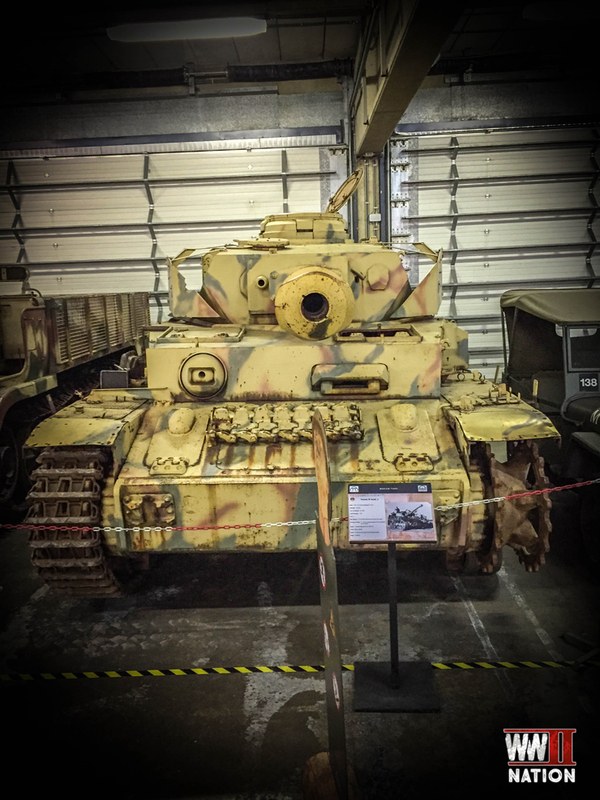 This example here is an Ausf. 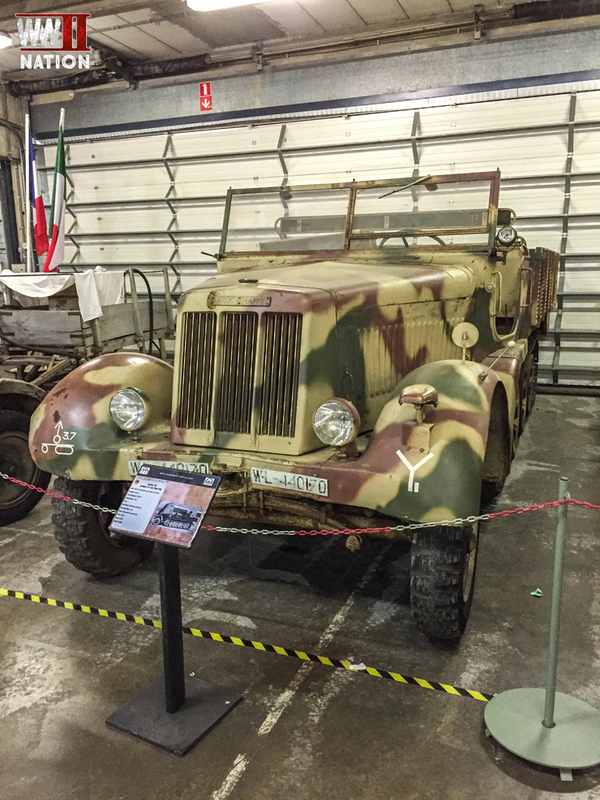 J Version which was actually the final production model and started to appear in March 1944. 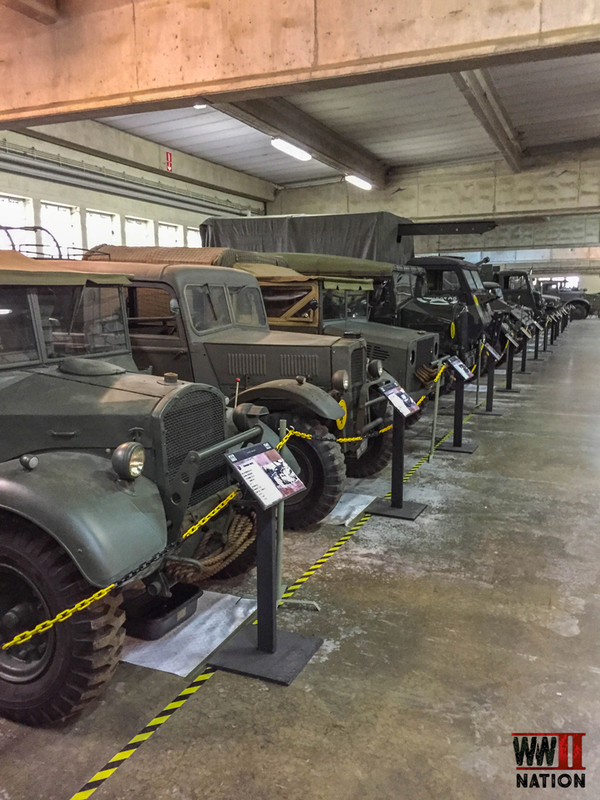 Interestingly the Bastogne Restoration Centre restores all sorts of historical vehicles from around the world and from different time periods, it is not solely the Second World War. 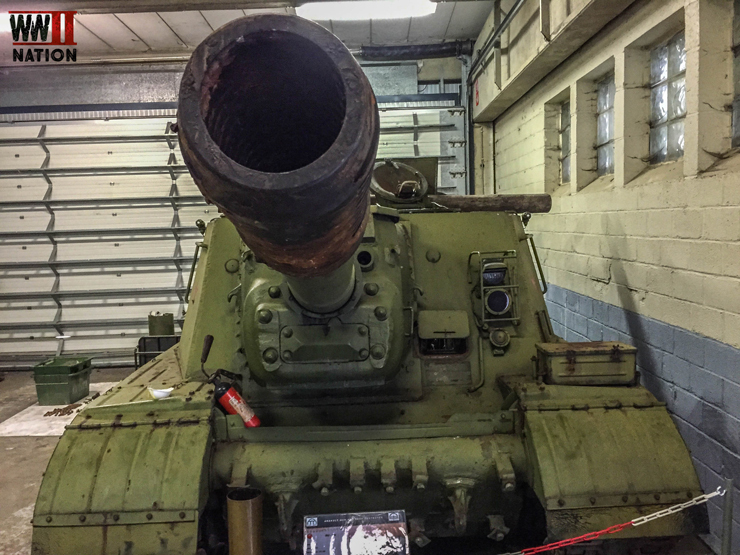 Looking down the barrel of a Russian ISU-152 K Tank. Manned by a crew of 5 this 47 tonne monster was equipped with a 152,4mm Howitzer. 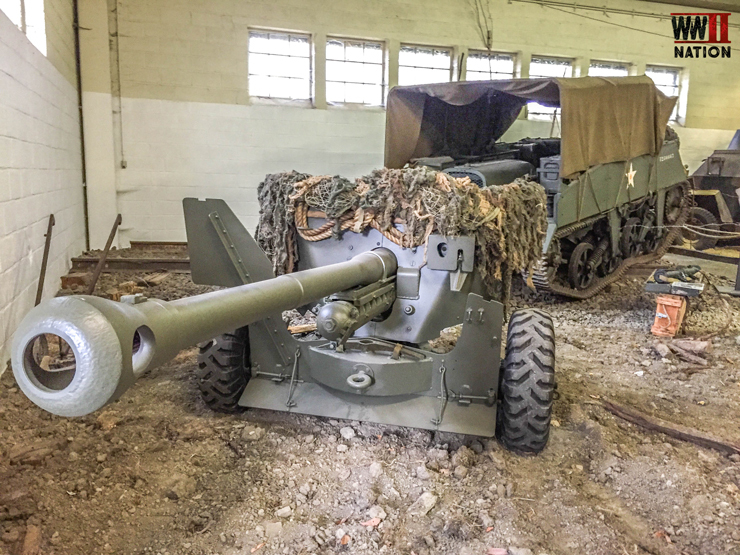 A remarkable example of an American M16 Halftrack Multiple Gun Motor Carriage which was equipped with four 50cal turret mounted machine guns – which according to our guide horrifically gained the nickname, the meat-chopper. No tour would be complete without showing a Sherman Tank. 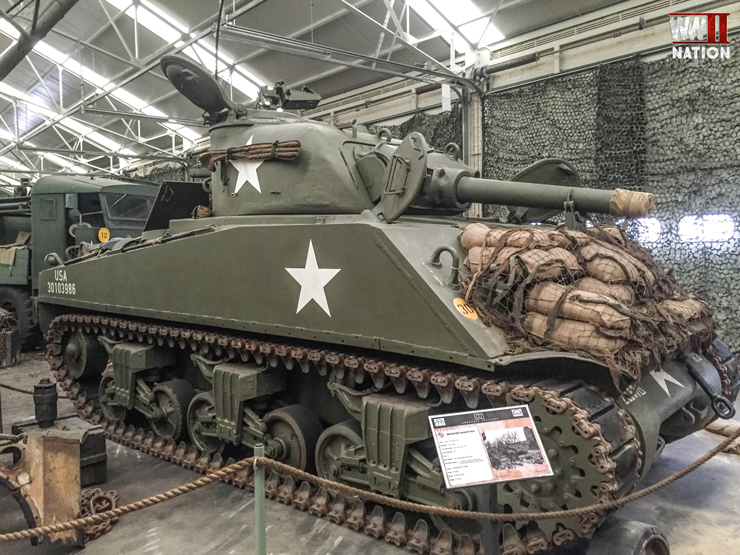 A medium M4A1 Sherman Tank model 76 W, equipped with a 76mm gun, crewed by 5 and weighing 33 tonnes. Around 3000 were made between May 1944-45. 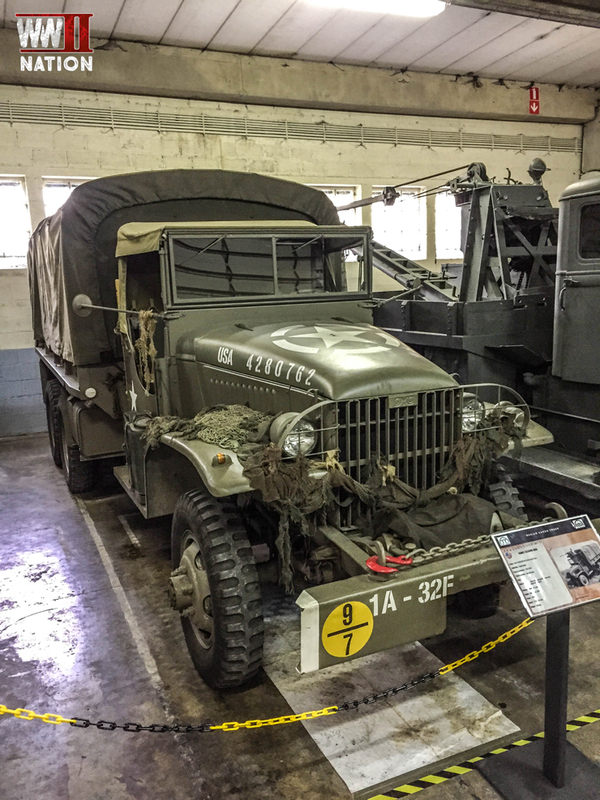 As mentioned it was not just Tanks on display here, there was a whole host of trucks & halftracks from all of the different nations involved, including for example the German SdKfz 7/2 and here the American GMC CCKW a 6×6 US Army Cargo Truck. 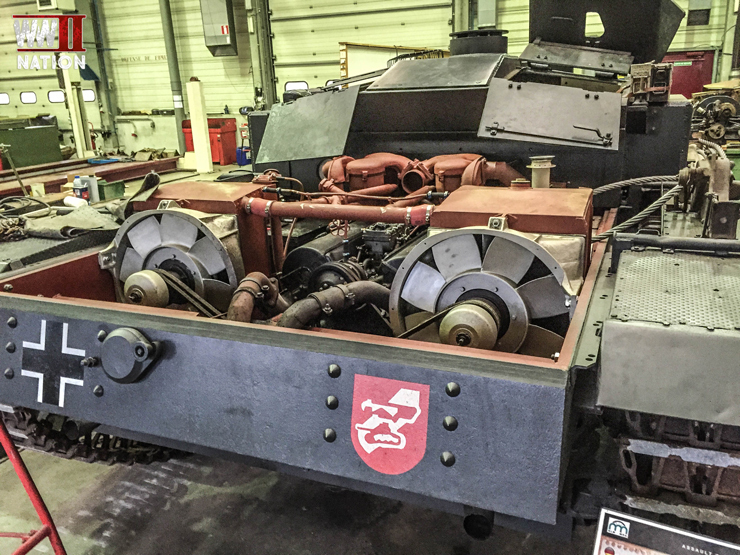 An interesting example of the SdKfz. 7/2 Halftrack which was typically armed with a 3.7 cm fully traversable Flak 36 anti-aircraft gun. 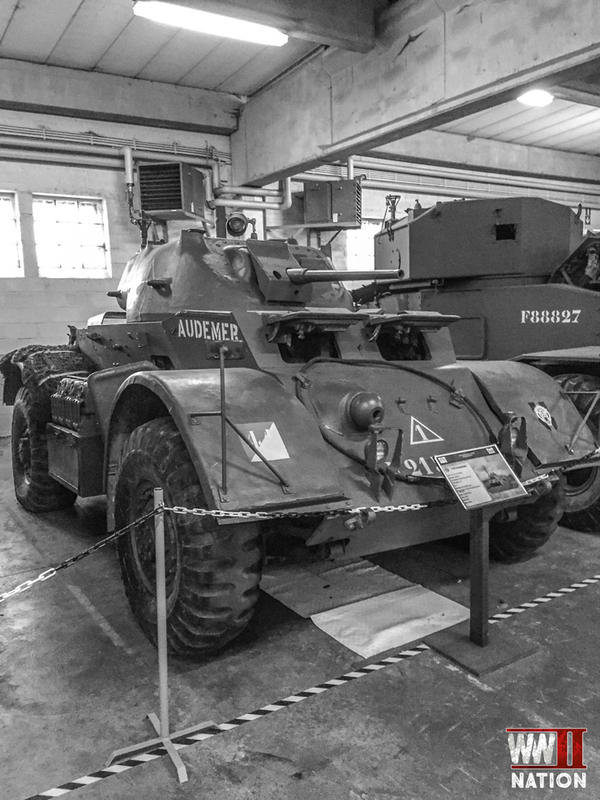 In the next hall there was a great panorama of the repair and recovery vehicles used by the Allied armies to salvage and restore damaged, knocked out or broken down vehicles on the battlefield. 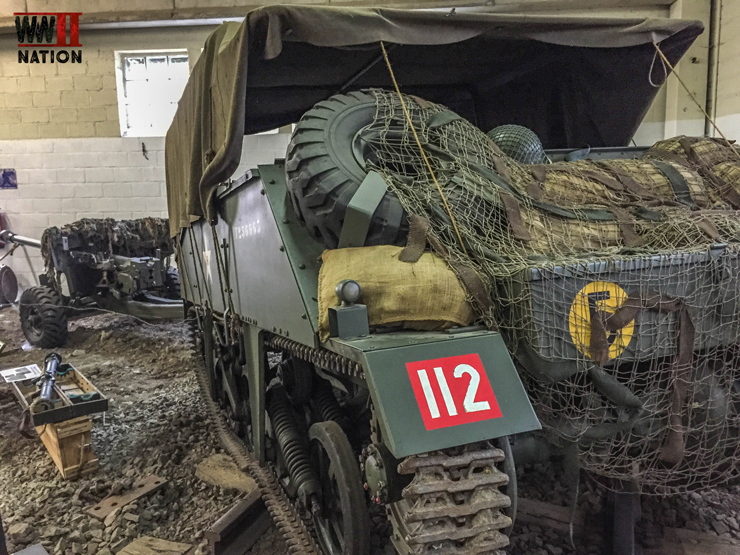 A massive factor in ensuring that many Allied vehicles were frequently reused and not permanently lost. 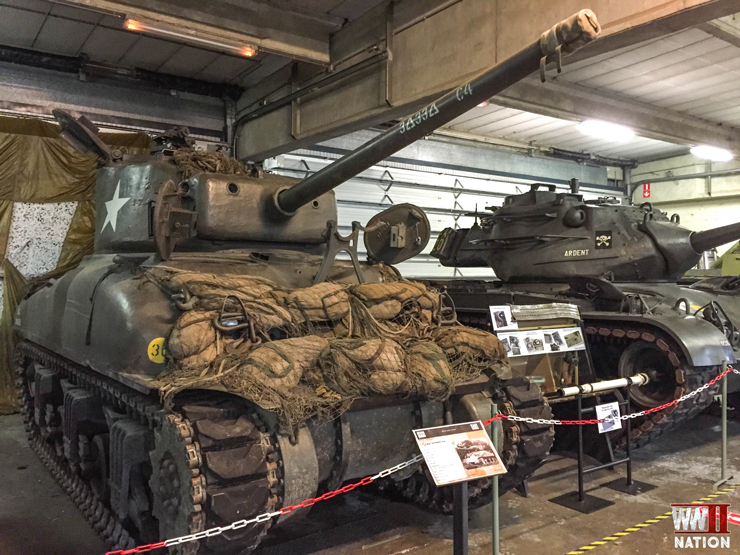 A different version of the Sherman on display here, this is an M4A3 equipped with a 105mm howitzer assault gun. 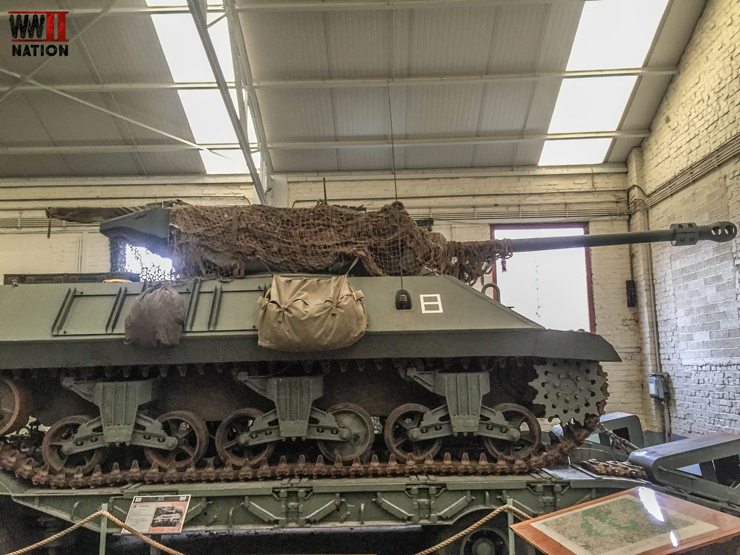 An Achilles Tank as it became known, it was a British modified version of the American M10 Tank Destroyer. 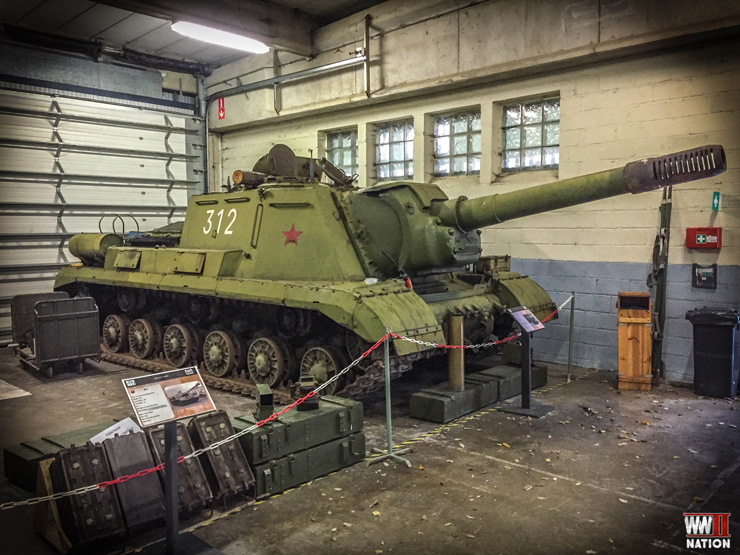 I was told by our guide that it was equipped with a British 17 pounder and consequently the turret had to be revamped with an extra weighted counterbalance at the back. 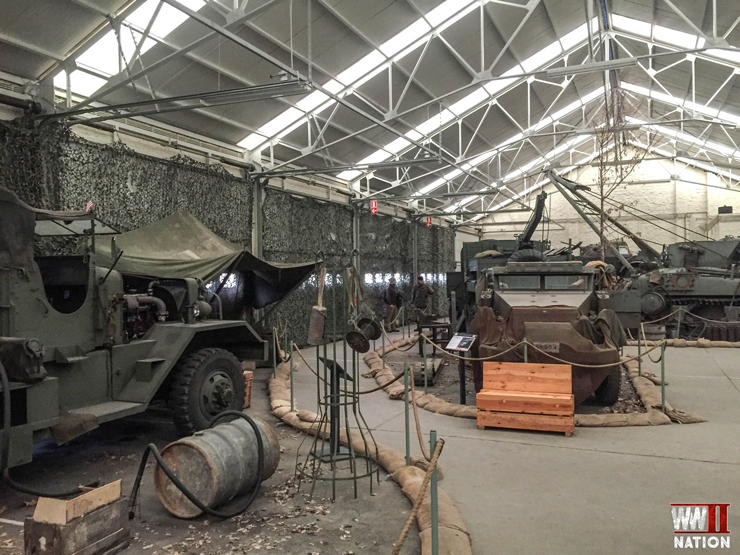 Having been mesmerised by all this WW2 related equipment and vehicles we finally turned our attention back to looking at the Barracks connection and role with the 101st Airborne Division during the siege of Bastogne. Entering Brigadier-General Anthony McAuliffe’s Command Post. 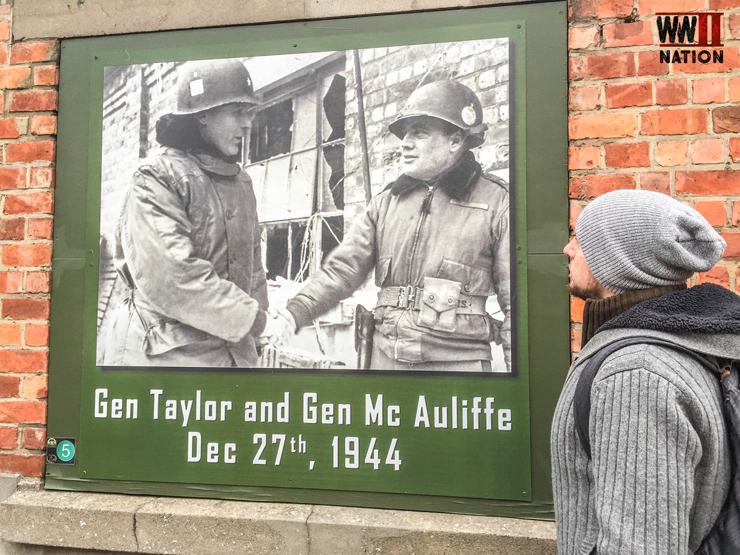 An interesting photograph here of General Taylor, the actual commander of the 101st Airborne Division who was stuck in Washington when the Ardennes Offensive began, finally managing to return to his men besieged in Bastogne on the 27th December 1944. So McAuliffe, who usually commanded the 101st Airborne’s artillery, was placed as acting commander of the whole division for a critical part of the siege. 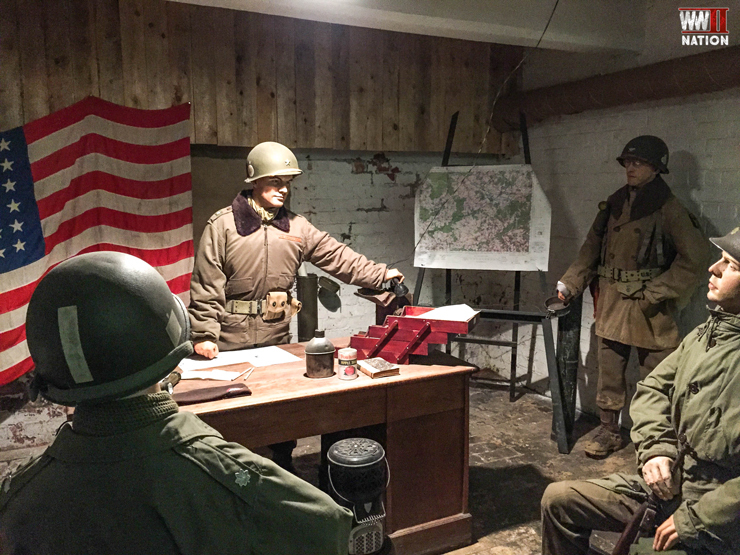 The Heintz Barracks was actually initially employed as Troy Middleton’s VIII Corps HQ before the Ardennes Offensive began. It was later taken over by Brigadier-General McAuliffe and his command staff following Middleton’s ordered departure by the Allied High Command. 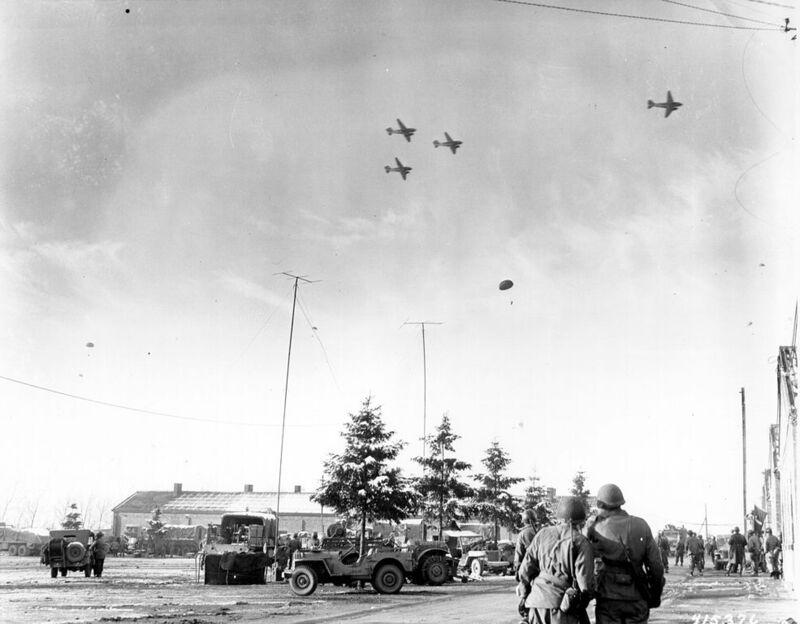 On the night of 16th December, Eisenhower ordered the 101st Airborne Division to get to the vital road network town of Bastogne. Travelling the 120 miles journey from Reims in France, elements of the 11,000 men of the 101st Airborne Division (Screaming Eagles) began to arrive in and around Bastogne on 19th December. Thankfully Colonel Roberts 10th Armoured Combat Command B had arrived the day before and because of his initiative to form road blocks at key junctures, managed to hold off elements of the Panzer Lehr and 2nd Panzer Division who had also been racing to get to Bastogne. 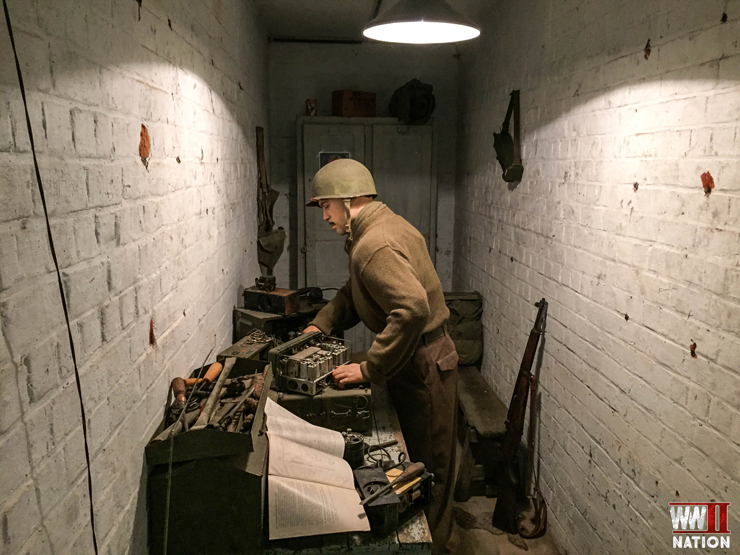 The Heintz Barracks became the vital nerve centre for organising the defence of Bastogne. By the 20th December the town had become completely surrounded by the 26th German Volksgrenadier Division. Ordered to capture Bastogne at once, on 22nd December General Luttwitz tried to seize Bastogne without a fight by bluffing the Americans into surrendering. It was from the Heintz Barracks encouraged by Lt-Colonel Kinnard to use his first response to the news of the German demands, that McAuliffe made his famous reply of ‘Nuts!’ to Luttwitz’s demands. 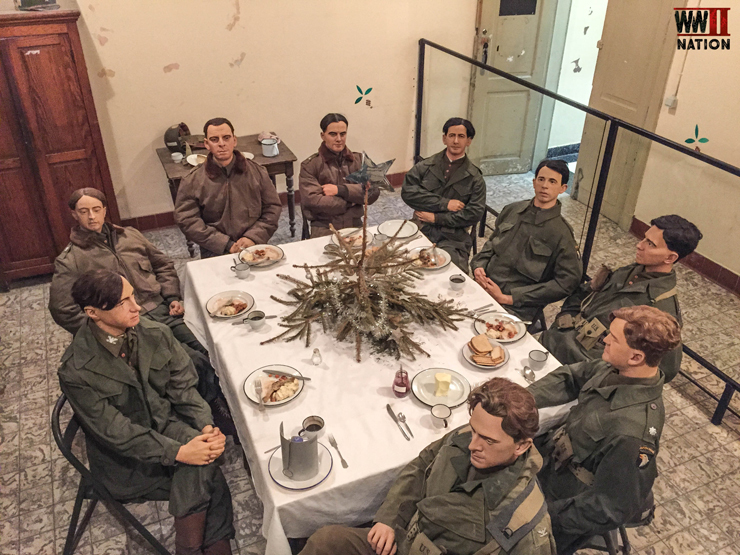 A replication of the famous photograph of the 101st Airborne Division commanders having Christmas Dinner at the Heintz Barracks. On 26th December 1944, elements of General Patton’s 3rd Army managed to break through the perimeter into Bastogne and establish a vital supply route via the Assenois Corridor which up to this point had had to be supplied via the air when weather permitted. Despite this relief, fierce fighting for, in, and around Bastogne continued well into January 1945. 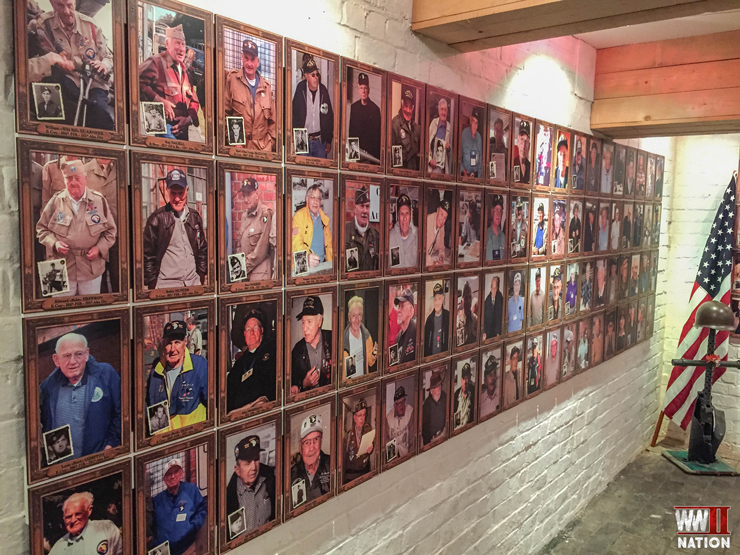 In the basement of the Heintz Barracks, today there is a remarkable tribute to all those veterans who fought here during the Battle of the Bulge and have since returned to revisit this site. Also on display here are both of the medals that were awarded to nurses Renee Lemaire and Augusta Chiwy for the incredible work they did in helping all the wounded here during the siege of Bastogne. 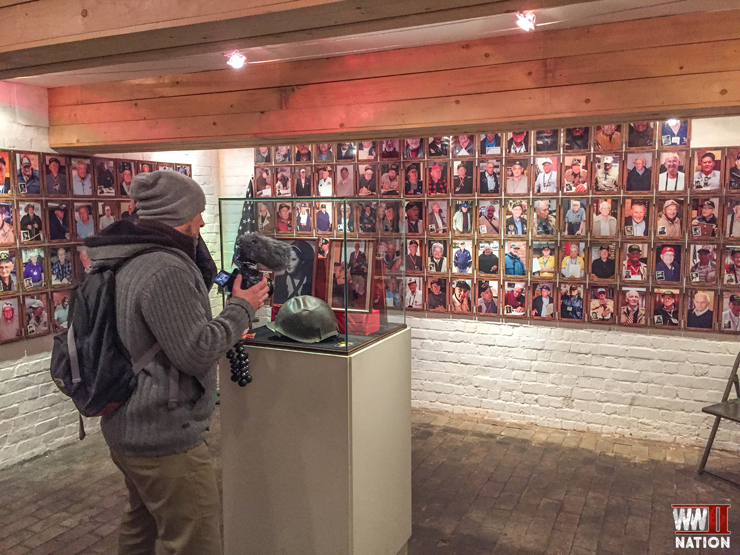 In our final day Vlog we will be looking at their story – the Angels of Bastogne. 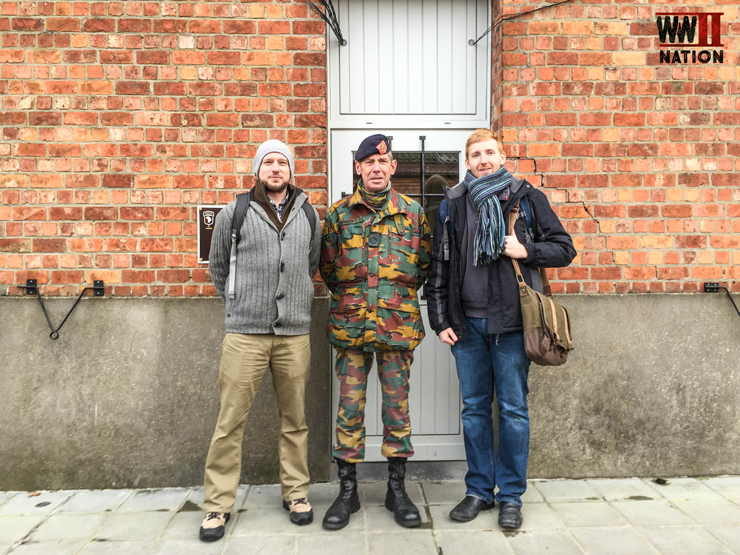 A big thank you to our guide Michel Marecaux who kindly put up with us whilst he showed us around Bastogne Barracks. 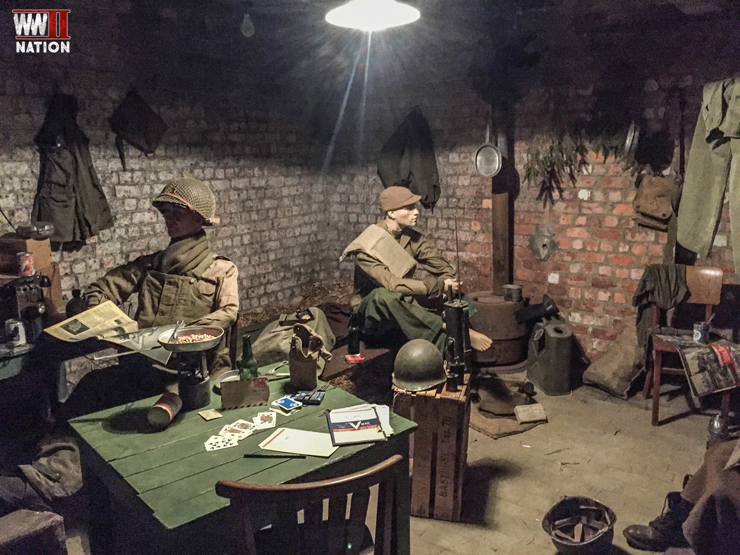 Since 2010 the base has become a form of interpretation centre for the local area’s connection with the Second World War. Admission is free. Guided Tours only from Tuesday through to Sunday either at 10.00 am or 2.00 p.m. and usually lasts around 90 minutes. 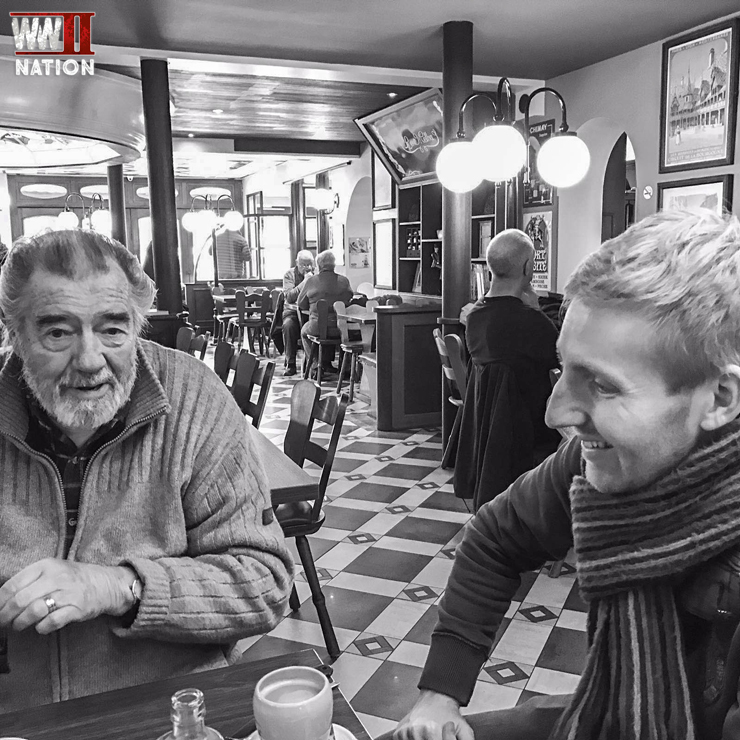 From the excellent Heintz Barracks we stopped off for a quick bite to eat, chat and to warm ourselves back up before heading to the Bois Jacques woods to learn about the 506th regiment and Easy Company’s role in the defence of Bastogne. Easy Company and the 506th P.I.R. arrived around Noville and elements were immediately thrown into the thick of the fighting, assisting Team Desobry (part of 10th Armoured Division) to hold off for 48 hours the 2nd Panzer Division. 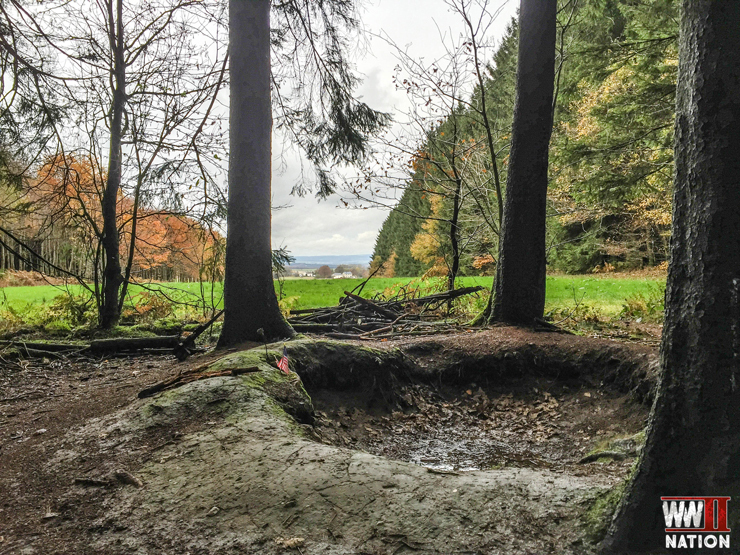 Before falling back to the Bois Jacques woods where they dug in and would remain here until the middle of January 1945. Conditions here and all around the perimeter were awful for those men manning their foxholes in Bastogne’s defence. Subjected to constant enemy shelling and fire, temperatures were bitterly cold, falling to at times -28 celsius, the men also had little food and lacked many medical supplies. 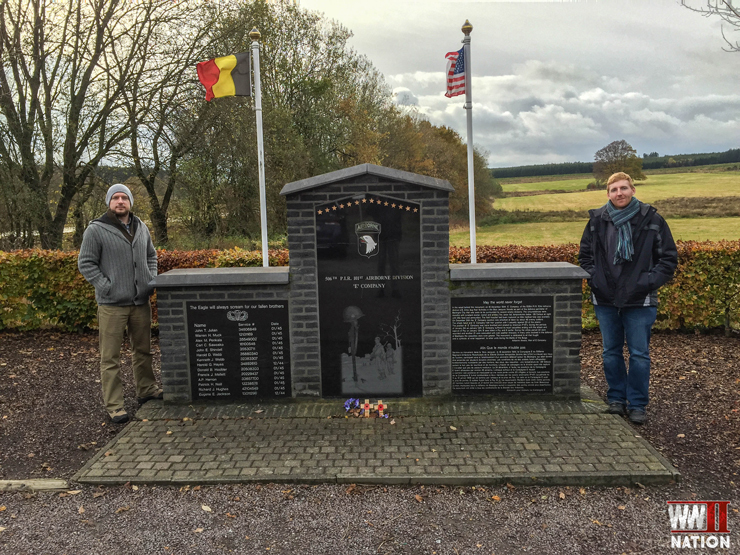 Dedicated to all those units that fought during the Battle of the Bulge, this monument was donated by Tom Hanks and HBO following the filming of the Band of Brothers mini-series and commemorates the 14 men of Easy Company who were killed in the Bois Jacques and Foy during this period. 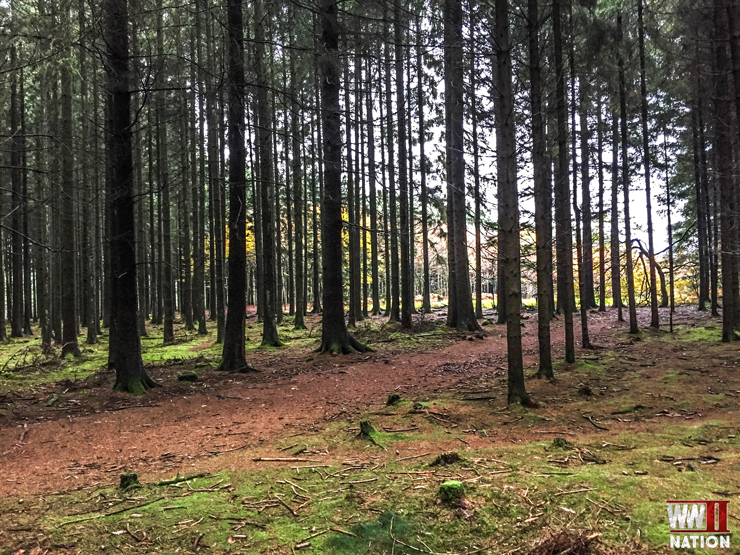 During the whole period of their occupation of these woods – eloquently nicknamed Jack’s Woods by the men – 32 of Easy Company were wounded and another 21 were also evacuated because of illness. Standing in an original fox hole which nature has slowly reclaimed down the years. Apparently the trees are cut down and replaced every 30 years, so what we saw was the 3rd generation of trees in the Bois Jacques since Easy’s occupation. Overlooking the village of Foy from part of the Bois Jacques. We were told by our guide that these were original positions that had been re-dug out again for the 60th anniversary by re-enactors. But there has been some debate on social media about whether these were at all original positions located just here to begin with. 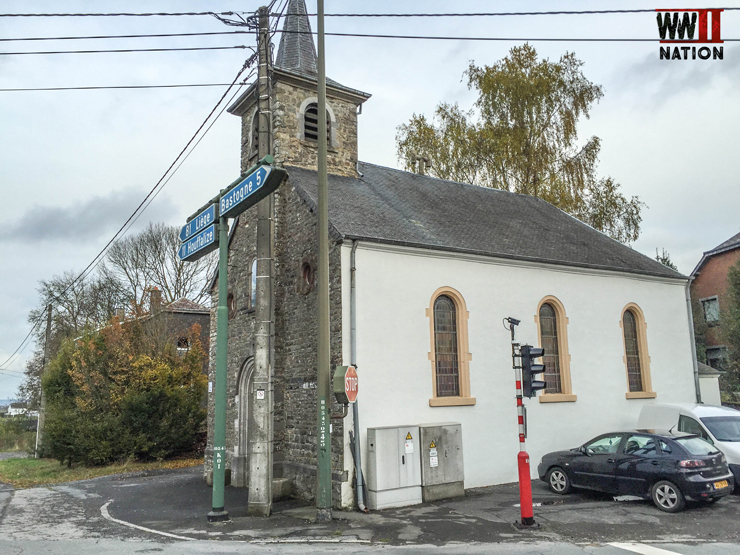 On 13th January 1945, 3 companies of the 101st Airborne Division, including Easy, attacked the village of Foy. 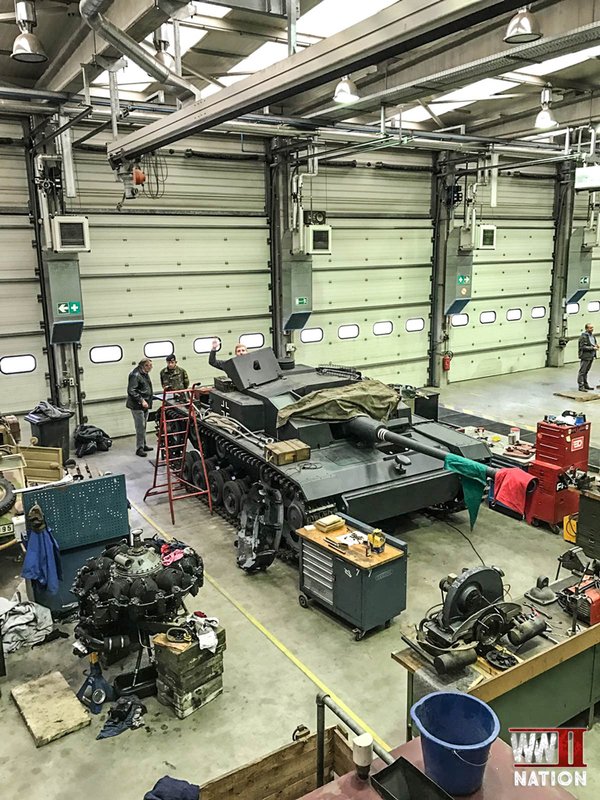 Originally seized by elements of the 2nd Panzer Division back in December, it was now occupied by elements of the 9th Panzer Division’s Panzergrenadiers. 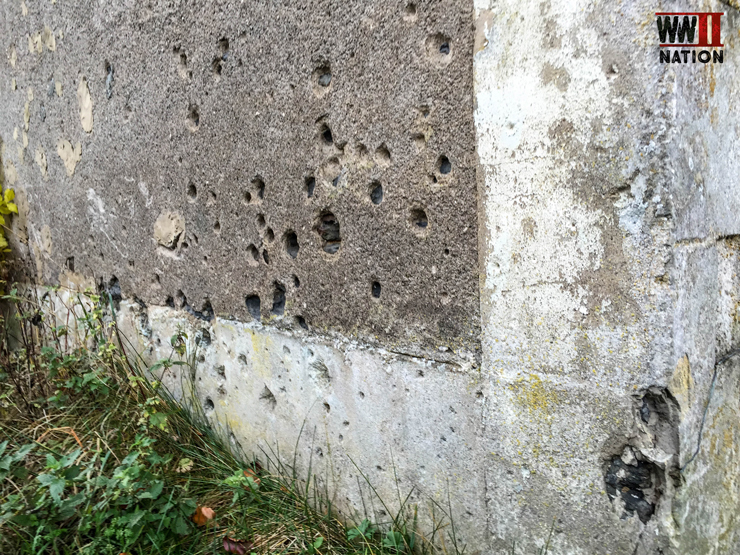 Battle Damage on the buildings of Foy: Advancing over open ground with only hay bails for cover, the 101st Airborne managed after a stiff fight to eject the Panzergrenadiers. However they counter-attacked the next day before the town was finally secured by the Americans. 8 men of Easy Company died in the fight for Foy. 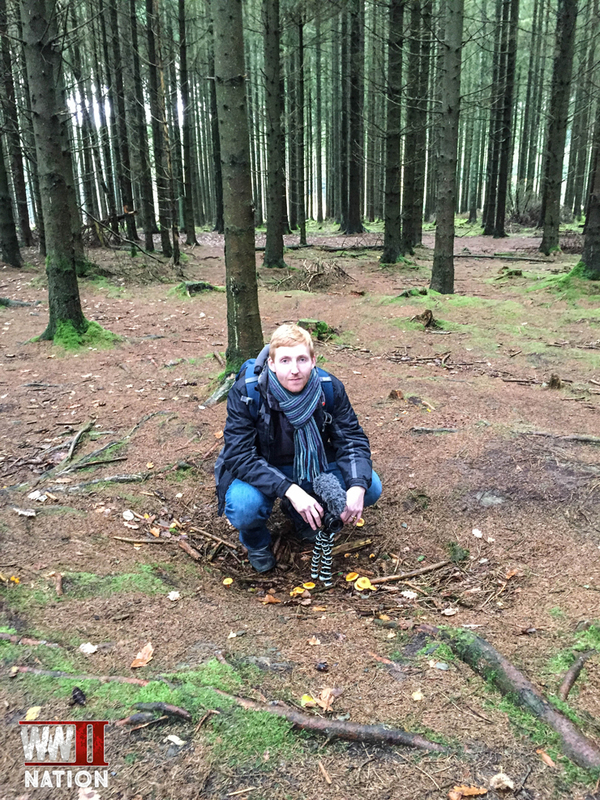 I hope you enjoyed our highlights from Day Two of our trip Exploring the Ardennes. 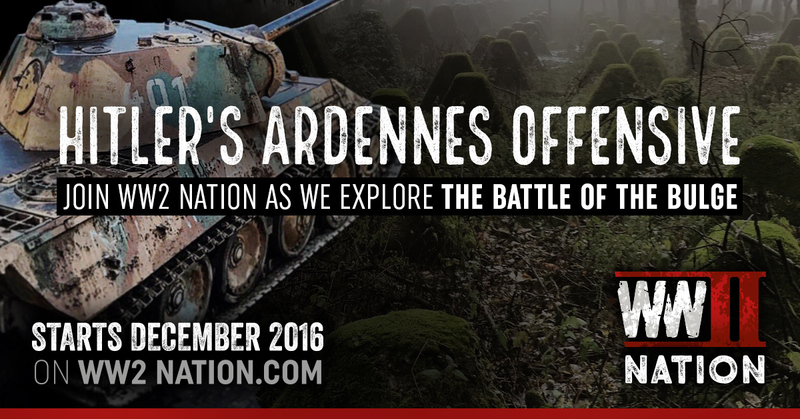 The First Vlog will be out this Friday to coincide with the anniversary, on the 16th December of the start of the Battle of the Bulge. 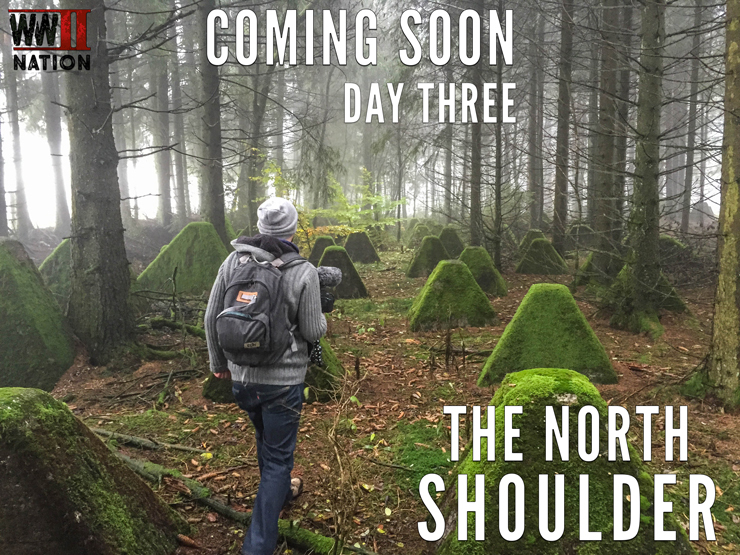 The Photo Journal of Day Three which sees us visit the North Shoulder to find a King Tiger Tank & explore part of the Siegfried Line, will be out next week. 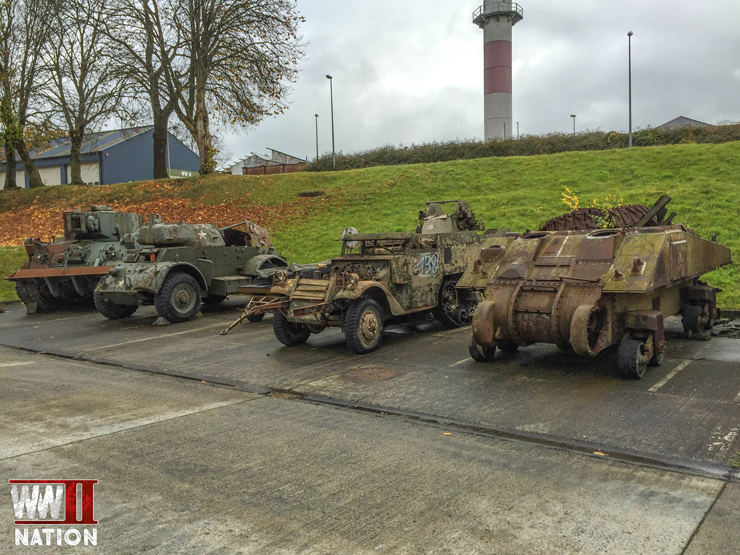 To find out more information about how you to could visit the excellent Bastogne Barracks and its WW2 interpretation centre, Click Here.